If I asked you to name the most famous artist born in Canada, you might reply, Celine Dion. Or if you like hockey, Wayne Gretsky. You're not alone, unless you're a bona fide Canadian, in which case he's your favorite painter. Until recently, there have been few Americans who have heard of Lawren Harris, and one is a name you'll recognize. Comedian, movie star, Oscars host, art collector. This sounds like the punchline of some sort of esoteric, highbrow comedy bit, but it's all true. Steve Martin so loves the paintings of Lawren Harris (think male version of Georgia O'Keefe, painting huge, unpeopled mountain-scapes) that he curated a show of Harris's work. That's right, the same guy who used to run around comedy clubs with a broken arrow on his head, who unbuttoned his shirt to become a Wild And Crazy Guy, who became King Tut on Saturday Night Live. He's a big time art collector. Martin traveled the length and breadth of Canada to personally inspect Harris canvases for a museum show of his work. So who's this Lawren Harris guy, and why is Steve Martin, of all people, curating an art exhibition? According to Taylor Poulin, the Boston Museum of Fine Arts curator who helped Martin install the show, Harris was something of a wild and crazy guy himself. Independently wealthy, Harris spent much of his life painting in desolate Canadian locations, from Lake Superior to the Rockies. A contemporary of Georgia O'Keeffe, he passed through New Mexico while she was living there, and it's more probable than not, as Roger Goodell might say, that he knew her work. Harris even traveled by Canadian government supply ship to the Arctic, painting in his bunk, a century before "adventure travel" made such journeys (relatively) easy and safe. If you're Canadian, his imagery of the wilds of Canada is stamped indelibly in your imagination. His work was featured on postage stamps and on World War II posters - this-is-the-land-we're-fighting-for kind of thing. So why haven't Americans, Steve Martin notwithstanding, heard of Lawren Harris? And why does Steve Martin care so much about the guy? Harris's paintings are, for the most part, quite large and stirring to look at - deep blues, a spirituality based in the then-popular religious movement known as Theosophy, and an Art Deco sensibility that place you firmly in the wilds of our neighbor to the north. If you picture mountains stylized as cathedrals of spirituality, you're on the right track. "He knew what he wanted," curator Poulin says approvingly of Harris, who would often ruminate for years on a given subject, painting smaller versions before he would create a masterpiece based on those earlier works. The same could be said of Martin, who spent a week at Boston's Museum of Fine Arts arranging the installation of the exhibition alongside MFA staffers. Martin also picked out 20 works from the MFA collection to hang in an adjoining room, to give Harris some historical context. "It's rare to see an exhibition of paintings by an artist of such national renown who you've likely never heard of," Poulin says. "It's not about seeing new or different works by an artist you already know. It's about experiencing an artist you're completely unfamiliar with." Unless, of course, you're Canadian. In Canada, Harris is the painting equivalent of a rock star, but because that nation's "patrimony laws" make it nearly impossible for non-Canadians to buy and export his work, Americans have never heard of him. Canadian desire to keep its great works to itself? Or a demonstration of how money talks in the art world - if American collectors can't buy it, they don't even want to know about it? Martin kicked off the exhibition with a live appearance at the MFA in front of 500 avid museumgoers, all of whom hoped he would pull a bent arrow out of a bag and put it on his head, play banjo, or unbutton his shirt and be a wild and crazy 70-year-old. Martin did none of those things. Instead, attired in a lovely dark blazer and muted power tie, he looked more like a gracefully aging banker who happened to look a lot like Steve Martin. Martin actually spoke on a panel with his artist friend Eric Fischl and New Yorker writer Adam Gopnick, both of whom failed to recognize that their roles were strictly ornamental. They both had important points to make, but the audience only wanted to hear from Martin, who waited courteously while they opined on art. Martin himself spoke about art so seriously - he says he will sometimes sit with his wife and just look at a "picture" they own -- that you kept waiting for him to stand up and tell you that the whole thing was a joke. There is no Lawren Harris and we'd all been pranked. Lawren Harris is clearly the greatest 20th century painter you've never heard of, and thanks to Steve Martin, you can remedy that situation at the MFA, but only before June 12. 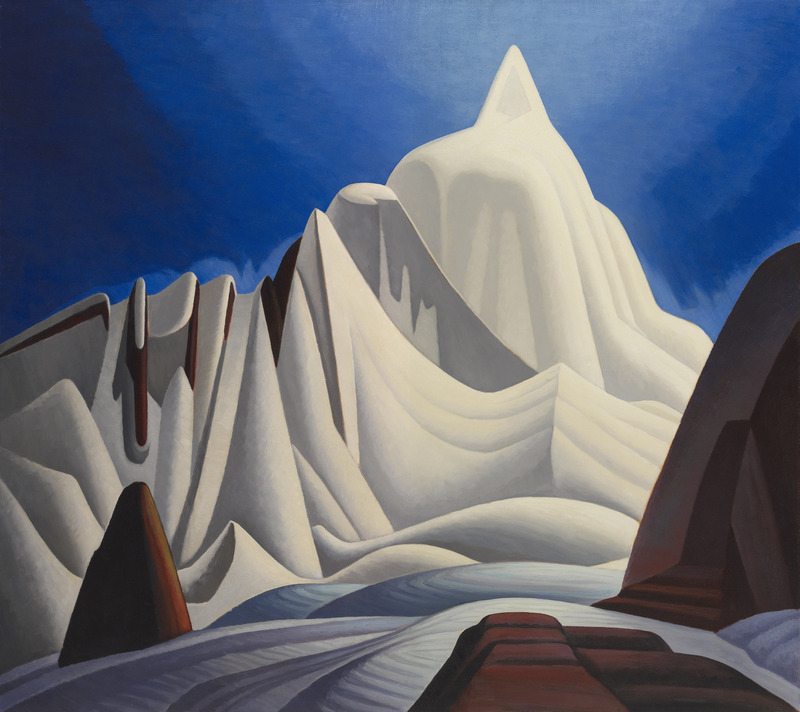 The Idea Of North: The Paintings of Lawren Harris, through June 12, Museum of Fine Arts, Boston. For further information, www.mfa.org.